The Fourth Judicial District Commission on Judicial Performance unanimously recommends, by a vote of 6-0, that Judge Lin Billings-Vela BE RETAINED. 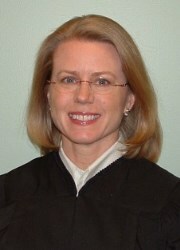 Judge Billings Vela was appointed to the Teller County Court in October 2011. Previously, Billings Vela served as a 4th Judicial District Court Magistrate, presiding over a juvenile caseload including dependency & neglect, family treatment and drug court cases (2009-2011). She twice worked in the 4th Judicial District Attorney’s Office and prosecuted cases in juvenile, county court, district court and the economic crimes division (1995-1997 and 2001-2009). From 1997 to 2001, Billings Vela worked in private practice as an associate with Anderson Dude & Lebel on civil matters, school law, domestic relations and municipal utilities law. Billings Vela received her undergraduate degree from Colorado College and her law degree from the University of Denver Sturm College of Law. In narrative comments on the survey, both attorneys and non-attorneys consistently describe Judge Billings Vela as calm, patient, respectful to all parties, fair, compassionate, thorough and knowledgeable on the law. Additional comments speak to her skills as a communicator and courtroom manager. Her written opinions are clear, organized and skillfully composed. She exhibits flexibility and creativity when faced with challenges particular to the rural community she serves. Judge Billings Vela also presides over the DUI problem-solving court, which is voluntary and has used only existing resources to achieve an 85% successful probation completion rate. This is over 10% higher than the success rate for those not using the problem-solving court. Judge Billings Vela continues to research factors in this result, and to pursue continual learning and improvement.